There may still have been crowds at brick and mortar retail stores on Black Friday but a new report suggests online spending sky rocketed on the day following Thanksgiving. According to research published by comScore, consumers spent $1.042 billion on Black Friday purchasing goods online, up 26% from the same day last year. That also makes Black Friday the “heaviest online spending day to date in 2012.” Spending for the holiday season so far this year, which includes the first 23 days of November, has already reached $13.7 billion. That’s up 16% from the same time period last year.. Shoppers also found time to step away from the turkey on Thanksgiving. Online holiday spending on Thanksgiving increased 32 percent over last year to $633 million, comScore said. Amazon was the top online retailer on Black Friday, followed by Walmart, Best Buy, Target and Apple. RESTON, Va., Nov. 25, 2012 /PRNewswire/ — comScore (NASDAQ: SCOR), a leader in measuring the digital world, today reported U.S. retail e-commerce spending for the first 23 days of the November – December 2012 holiday season. For the holiday season-to-date, $13.7 billionhas been spent online, marking a 16-percent increase versus the corresponding days last year. Black Friday (November 23) saw $1.042 billion in online sales, making it the heaviest online spending day to date in 2012 and representing a 26-percent increase versus Black Friday 2011. Thanksgiving Day (November 22), while traditionally a lighter day for online holiday spending, achieved a strong 32-percent increase to $633 million. To read more about the historical importance of Thanksgiving Day, Black Friday and Cyber Monday to the online shopping season, please visit the comScore blog. 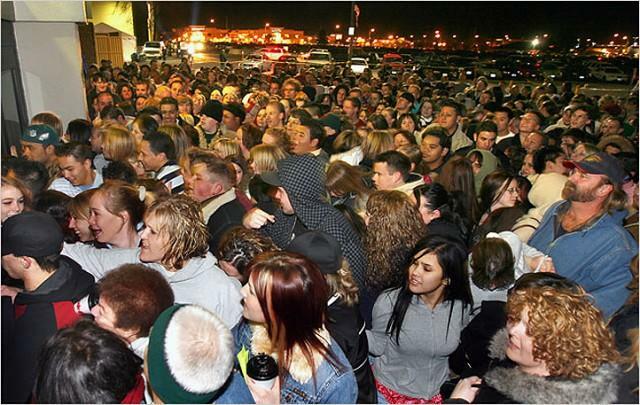 57.3 million Americans visited online retail sites on Black Friday, representing an increase of 18 percent versus year ago. Amazon ranked as the most visited online retail site on Black Friday while also posting the highest year-over-year visitor growth rate among the top five retailers. For the holiday season-to-date, Digital Content & Subscriptions is leading the way as the top-growing online retail product category (up 29 percent versus year ago) as the rapid adoption of smartphones, tablets and e-readers continues to drive demand for digital books, audio and video content. Toys are also performing well online thus far with a gain of 27 percent, followed by Consumer Packaged Goods (up 23 percent), Video Game Consoles & Accessories (up 18 percent) and Consumer Electronics (up 18 percent). The Apparel & Accessories category had a very strong Black Friday to rank as the #1 category for online spending on that day, accounting for more than a quarter of all dollars spent. The category has historically ranked #2 behind Computer Hardware, as it did on Black Friday 2011.